I haven’t seen my house for a few weeks but the renovations are nearly finished and I’m dissatisfied already! But only in my head, you understand. I think it’s a case of renovation envy. It all started when I visited a lovely new friend in Anglesea – she’s a writer and artist – and had lunch in her beautiful home. You can see her artist’s eye at play everywhere; the triangular patterned tiles echoing the earthy shades of terracotta and blue on the walls and in the boxed shelves, the art on the walls, the huge (and well-fitting windows) framing views of gnarled and forked gum trees, the marble-top kitchen and chunky pottery dotted around, the funky butter dish, the lime green weighing scales, the brightly coloured mosaic tiles in the bathroom beautifully toned in with the sink, a colourful Mexican-looking ceramic bowl. And then there’s the wood burner with the sliding glass front warming the room and adding another stylish touch. If only I’d seen her house before I chose the white subway tiles from Bunnings, I thought going all Discontented Pony (anyone else familiar with the Ladybird Books story from childhood? 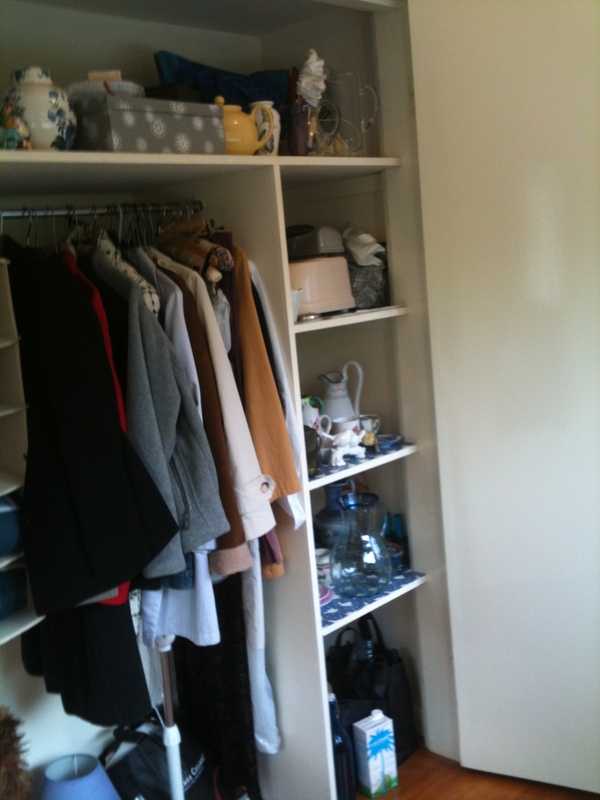 ), and maybe I should have persisted in getting the shelving unit in the living room re-done the way I wanted. And then what about my kitchen bench top fiasco? In truth the kitchen tops are the only part of the renovations that have gone a bit ‘off message’ and it’s one of those situations where it’s not really anyone’s fault. My builder – and I can’t praise him enough; he’s absolutely meticulous, punctual, professional and gentle with it – noticed that the laminex pattern I had chosen was 30 per cent more expensive than the standard range. So he hunted around and found a match from another company. He showed me the sample when I went up to the house at the end of March, and I approved it. What neither of us noticed (the sample was the size of a match box) is that it had a strange indentation which, over a large area, looks like a series of scribbly scratch marks. While it’s not what I would have chosen, I’m going to make the best of it. The bottom line is that changing it would stuff up the budget bottom line by $2000. And once all my things are dotted around – yellow lemons on my grandmother’s green cake stand, my Italian ceramic fruit bowl (also featuring lemons), my blue and white candlesticks and all the other paraphernalia and memorabilia currently stacked floor to ceiling in various cupboards, the strange scribbles will fade into the background. And that’s the thing. My style is my style. Although I am a little restricted by a modest budget, my choices reflect who I am and where I hail from. I’m not an artist with an eye for the Tuscan look and triangular tiles, but I am a homemaker through and through, and the interior of my house is a somewhat eclectic mix of classical English meets country cottage meets suburban Melbourne. I’ve got some treasured antique pieces from both my grandmothers, a fair few bits of charity shop chic, a bit of IKEA and lots of pictures on the walls, none of them which could be described as modern or abstract. So when I embarked on renovation plans, my aim was to keep a classical, if slightly quirky, look. Hence the claw foot bath, black and white tiles and hand-crafted cloche light in the bathroom, and the white painted shelving unit on either side of the fireplace so I can – at long last– display all my treasures from an antique ginger jar to more modern glassware, favourite books, tea cups, jugs and ornaments. In fact the older I get, the more I love antiques, not just the look of them but the stories behind their design, creation and use. I’ve been watching a British program on SBS called Antiques Uncovered hosted by an historian and an antiques expert. In the last episode they went to Woburn Abbey in Bedfordshire to look at the history of tea cups, sofas, Georgian glassware, chandeliers and more. It’s all a bit broad brush as they cover so many items in one program, but I particularly enjoyed the bit about the history of porcelain. 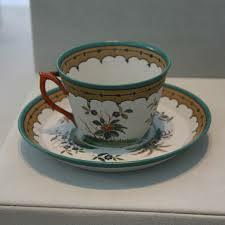 The Chinese, of course, developed porcelain in the tenth century, but it was not until the British discovered the magic ingredient, Cornish soapstone (talcum powder), that porcelain or, ‘White Gold’ as it was known, became all the rage in the eighteenth century. And it said something about your class as to whether you drank from translucent china which held hot water without leaking, or from a rough, porous earthenware cup. The upper classes could pour the hot tea straight into the cup and then add the milk, whereas the lower classes had to put the milk in first to prevent the cup from shattering. That’s why the ‘right’ way is still considered to be the tea first method. It’s like Downton Abbey – I’m an unashamed fan (although the last double bill episode of Series Four was terribly implausible and a big anticlimax) – it’s all about class and what’s going on Upstairs and Downstairs. I recently signed up to a free online dog training course. More fool me. There was nothing free about it. It started harmlessly enough with a couple of emails with some treat-size tips on how to stop a dog jumping up, but as the days progressed the tips and tutoring, supposedly dangled as carrots under my nose, were lost among paragraphs of waffle, sales pitch hype and endless calls to action: Exclusive offer! Sign up as a member today and receive a 60% discount! But hurry, offer limited! And, if I signed on the dotted line, I would receive three books normally valued at $100, a 30-day money back guarantee and MUCH MORE! Plus, they claimed to have some sort of copyright on the secrets to dog training; I wouldn’t find them anywhere else, not on this planet, in Outer Mongolia or in Outer Space. But I did need to sign up first. Well, forgive the pun, but I didn’t jump at it. Affiliate marketing schemes use the same technique and lure you into reading screen after screen of repetitious copy full of impossible promises, testimonials and videos. I once watched a clip of two dudes in expensive shades sitting by a swimming pool explaining how they had gone from rags to riches. For ten minutes they kept telling us that they would soon tell us how they did it. There was even a stopwatch on the screen counting down to their Big Bang revelation which, of course, never came. Because you had to sign up first. It’s like waiting for the next episode of a television drama – you know the ones that end with a tantalising scene such as a dead body or a lovers’ tiff – so you have to tune in the following week. However, I was nice – very nice – to the young Indian guy who came round with the (free) government-issued Smart Power Boards – the ones that turn your TV off automatically rather than leave it on stand-by. It’s a tough job knocking on doors and making sales so I was pleasant, chatty and even offered him a cup of tea. I asked him to plug my DVD into the normal socket so it would not switch off while in record mode. Later that week, when I sat down to watch an episode of Downton Abbey (and I LOVE DOWNTON ABBEY) the screen was blank as the guy had plugged the DVD into the wrong socket. Arghhhhhhh!! Once again, I was left hanging in suspense.